Robometricschool. - There are many modern or sophisticated technology that display in CES 2014 in Las Vegas United State this time. It also happen in robot technology that present here. 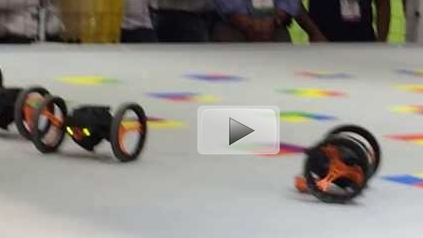 Two kinds robot that make scandalize in CES 2014 in Las Vegas is Jumping Sumo robot and also Mini Drone robot. The Jumping Sumo is one robot that able to jump and roll was able to seize the attention of thousands of pairs of eyes of visitors CES 2014. The robot can also be operated with a smart phone. Beside Jumping Sumo that presented, other robots are also sophisticated is Mini Drone. Present at the exhibition, tangible robot mini helicopter that flew to and fro. Equipped with four blades and two large wheels, this robot drone tub that often adorn the sky in the Middle East.